The closure and proposed demolition of the grand old Fauborg Hotel in Beverly Hills prompts psychologist Alex Delaware and his girlfriend Robin to pay a last visit to a favourite haunt, but whilst they’re sipping cocktails they are intrigued by the glamorously dressed young woman in dark glasses drinking alone. Delaware things nothing more of it, until his friend, LA homicide detective Milo Sturgis, asks for his help on a new case and shows him a picture of the victim, a young woman who’s been mercilessly gunned down, though her face has been destroyed Delaware still recognises her as the young woman from the Fauborg. As Sturgis and Delaware dig into the case, what begins with a link to an online dating agency connecting wealthy older men with beautiful young women quickly devolves into something altogether more seedy, with a cast of characters, any one of whom might be responsible for the young woman’s death, but can they determine the real killer or killers, and will they be able to explain the mystery of how she was shot with two different guns simultaneously? As near as I can figure it Jonathan Kellerman has published over thirty novels centred around (or featuring) child psychologist Alex Delaware and unconventional LA cop Milo Sturgis. I’m not sure just how many I’ve read over the years, nowhere near all of them I think, but I’ve read enough that, even though it’s been a couple of years since I last read one, coming back to their world was like visiting with old friends, and the best thing about Mystery is the easy going relationship between Delaware and Sturgis, Delaware’s slick intellectual forming the perfect foil for Sturgis’ constantly hungry, cliché busting detective and the book is at its best when they’re acting in concert. The central mystery of ‘Mystery’ is somewhat less impressive, although it’s a solid enough police procedural that follows the usual pattern these books tend to, the detective(s) wander from clue to clue, interview to interview, some are red herrings, some aren’t helpful, but eventually the facts build up to reveal motivation and the identity of the killer. The cast of characters all come alive, and each is memorable in his or her own way, but Mystery is a little weak because it relies on several contrivances and information we weren’t privy to (always a problem in detective fiction). Additionally the subplot involving Delaware helping the child of a terminally ill former madam come to terms with her impending death never really catches on. It’s a solid, if slightly by the numbers, entry into the series, but engaging enough, especially for a long term fan. Much as I love history, it has to be said that some history books can contrive to make even the most interesting of subjects seem dry, even dull. Boris Johnson’s biography of Winston Churchill is not such a book. Johnson begins in 1940, with Churchill newly installed as Prime Minister and facing an offer from the Germans, a kind of live and let live; a peace treaty that would have, in hindsight, likely let the Nazi rampage across Europe go unchecked. Imagine if Hitler had been able to concentrate all his forces on Russia, and imagine if the US hadn’t entered the war, worst still imagine if there hadn’t been a handy island off the coast of Europe from which to launch the liberation of Europe even if the US had decided to intercede. Of course the men—and they were all men—who sat in Downing street with Churchill had no way of predicting the future, what they saw was a diminished Britain, an army in retreat, a populace hardly aching for war, and an enemy that seemed unstoppable. In the face of all of this it was Churchill who pushed to refuse all overtures of peace, Churchill who, through sheer force of will, made Britain stand her ground in those early years whilst he waited for America to make her mind up whether or not to intervene. Not that he left the US to it, far from it, like a boy chasing a girl who’s far too pretty for him Churchill wooed America, wangling concession after concession, even if at times the price was high (for the record we made our final repayment to America circa 2008 for their ‘help’ during WW2) and sometimes all we got were old rifles and rusty ships. Churchill has undergone revisionist history in recent years, as people have poked holes in the legend, rightly pointed out the mistakes (and there were a lot of them and some of them were pretty catastrophic) and highlighted the less salubrious elements of his character: the racism, the suggestion that poison gas be used on Arabs, his order to soldiers to fire on strikers if needs be. And yet in spite of this Johnson argues, forcefully yet eloquently, that Churchill was pivotal to defeating the Nazis, even if by the end of the conflict the net contribution of British and commonwealth forces was far less than the contributions of the Russians and Americans. Remember though, in 1940 the Americans wanted no part in another European conflict, and the Russians had signed a pact with Hitler to carve up Poland. If Britain, chivvied on by Churchill, hadn’t stood her ground in 1940 it’s probable the world would look very different today. Though Johnson argues there’s far more to Churchill than his wartime exploits, and from his schooldays to his time as a reporter on the front lines, his long political career (which, remember saw this supposed bastion of conservatism switch sides to the Liberals for a long period) his highs and lows in both wars, his appetite for alcohol and smoking, his ability to function on barely any sleep and dictate ream after ream of notes to his army of secretaries. This was the man who sparked the initial idea for the tank, this is the man who coined the term “The Iron Curtain”, one of the few to see what a threat the jumped up corporal in charge of Germany might be, and what threat the Soviet bloc might pose. Johnson skips back and forth along Churchill’s timeline, essaying a boy deemed something of a runt eager to impress his cold father, and reliant for some of his early opportunities on the, ahem, dalliances of his American mother. What becomes apparent is that Churchill was something of a one off, and that his one of a kind recklessness could be as much a negative as a positive. He was certainly no coward, and was one of the early pioneers of flying. In fact it’s incredible to see how many times Churchill placed himself in harm’s way, how many brushes with death he had—charging the enemy in Africa, car crashes, plane crashes. In fact several of his flying tutors died in crashes not long after tutoring him. He had to be talked out of stationing himself on a ship in the channel during the D-Day landings to boot! We all have a vision of Boris Johnson in our heads, the clownish buffoon, the man who can get away with things few other politicians can, and it’s clear he seems Churchill as a hero figure, and also as a kindred spirit (and I think it’s a safe bet that Boris would like to emulate Churchill in several ways, most notably in relation to 10 Downing Street). What it’s often easy to forget about Boris is that he’s an intelligent man, and as it turns out an excellent writer. He’s erudite and amusing and his prose rattles along at a fair old pace. Yes at times there are a few golly gosh turns of phrase, and he used a number of words that had me reaching for the dictionary, but for the most part this is an engaging and accessible book and frankly more history should be like this. 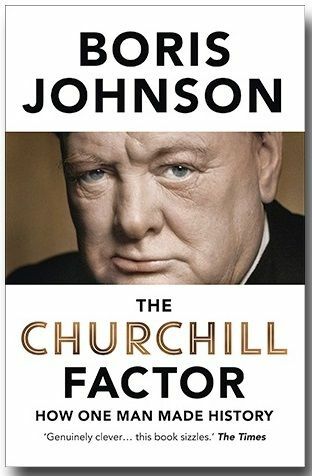 His bias is pretty clear, he admires Churchill and it shows, but what history book or biography isn’t written from one perspective or another, and Johnson doesn’t try to blindside the reader, and even if he does at times defend some of Churchill’s excesses he never excludes them and he isn’t shy of admitting where the man got things horribly wrong. What emerges is an interesting study of a man who really was unique. Was he brave or reckless, impetuous or decisive, arrogant or genius, moderniser or conservative, pro or anti-European…the truth that comes across from Johnson’s work is that Churchill was, at one time or another, all of these things, a mass of contradictions who could order soldiers to use force against strikers, yet who, along with Lloyd George set in motion the initial foundations of a welfare state, he was a man who preached about the Iron Curtain and the dangers of communism long before the cold war truly began yet who desperately wanted East and West to come together (this is the man who created the word summit in reference to a meeting of world leaders after all) a man who led his nation to the pinnacle of its greatness to the start of its decline as a major world power. Whatever your view of Churchill it’s hard to imagine the history of the 20th Century without him. Heartily recommended. 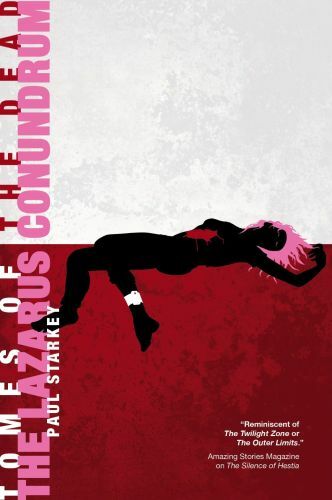 Friday was a bit of a red letter day for me, as it was the day my novella The Lazarus Conundrum was published by Abaddon Books. When I first submitted my idea, way back towards the start of the year, I could only hope that my idea would be picked, but I knew even then that I’d be up against stiff competition. Getting the email back saying my story was one of three that were chosen to be published was a wonderful, and yes, slightly scary, thing,but mainly wonderful. Writing The Lazarus Conundrum was a lot of fun, it was hard work, and just occasionally frustrating when I couldn’t get the words to say what I wanted them to say, but I wouldn’t have missed the ride for the world. “In a world where the dead routinely return to life, the most shocking mystery is when someone doesn’t. You can download The Lazarus Conundrum from Amazon.co.uk, Amazon.com and all other Amazon sites for a very reasonable price! Directed by Sam Mendes. Starring Daniel Craig, Léa Seydoux, Christoph Waltz. Whilst supposedly on leave James Bond (yes we’ve been expecting him) travels to Mexico City where he thwarts a terrorist incident and kills a vicious assassin named Sciarra. Back in London M (Ralph Fiennes) demands to know what Bond was up to in Mexico. Unhappy with 007’s glib response M relives him of duty. That evening Bond receives a visit from Moneypenny (Naomie Harris) who hands him the few bits and pieces that survived the destruction of Skyfall, amongst them a photo of the young James in Austria with the man who took care of him after his parents death, a man named Oberhauser. After Moneypenny departs it becomes apparent that Bond tracked Sciarra down acting on information supplied by an old friend, the old friend told him to kill Sciarra, but insisted that Bond then attend his funeral. After paying a quick visit to see Q (Ben Whishaw) Bond sneaks off to Rome for the funeral. There he meets Sciarra’s wife, Lucia (Monica Bellucci). After saving her from assassins she explains that her husband worked for a secret organisation and that a meeting will be held that evening to choose the person to replace Sciarra. Bond infiltrates the meeting but his presence has been expected and he just escapes with his life. There’s a sporting aphorism that states that football is a game of two halves, and with that very much in mind I’d like to suggest that Spectre is a film of two halves, a film that elicited quite different reactions from me at different points. For quite a while I thought it was awesome, in fact at one point the thought that this might be the best Bond film ever likely flitted across my mind, however as time marched on I found myself enjoying it less and less. Whether this is down to my own high expectations, or down to the film losing its way is, well, a matter of opinion I guess. Early doors though the film is swaggeringly magnificent. The pre-title sequence set amidst the Day of the Dead festival in Mexico is quite stunning and this leads into a wonderful title sequence that even manages to make Sam Smith’s bland ballad sound good. Then we’re back in London for some wonderful interactions between Bond and his MI6 colleagues. M’s not happy with 007, but Moneypenny and Q are more amenable. Fiennes continues to make for an excellent M, although I can’t help thinking he can only get better because at the moment he’s too close in age to Bond to feel enough like his superior. Harris continues to excel as Moneypenny but the standout is Whishaw as Q who gets all the funniest lines and who gets to trot out into the field at one stage, ably assisting Bond in Austria. The scenes in Rome look gorgeous, as does the truly stunning Monica Bellucci, in fact the only problem with Bellucci’s role is that it’s way too small, which is a shame. The mysterious meeting is suitably creepy, as is the entrance of Mr Hinx (hulking wrestler turned actor Dave Bautista) and the car chase through Rome is stunning—and quite amusing— even if the tension’s drained out of it a little by Bond having a phone conversation in the middle of it. The Austrian bits quite obviously evoke On Her Majesty’s Secret Service, and there’s a great set piece car/plane chase. It’s at this point that the film, for me, loses its way a little, and I’m afraid much of that is down to the nature of the villains. Christoph Waltz is a fine actor who can be genuinely menacing (see Inglorious Basterds for further details) and when he was cast I was thrilled, especially given who he was likely to be playing. And yet at the moment I feel he was miscast. I think this role needed someone with a bit more oomph about them, he’s too subdued. You can argue Javier Bardem went too far the other way but I like my Bond villains over the top and Silva beats Oberhauser by a mile in my opinion. It might not be so bad but the manufactured nature of the connection between him and 007 feels utterly false. There’s also the issue of the big reveal (which any Bond fan worth their salt can’t help but know is coming) because it’s only there for the audience, it has no relevance to Bond at this point. Throwing in certain other elements treads perilously close to making the character seem like a parody. It might not have been so bad but his grand scheme lacks a certain pizzazz as well. I realise that the days of laser satellites and stolen nuclear bombs may be behind us, but even in this post Snowden world the notion that the bad guy will just be able to read all our emails lacks a certain sense of threat. In many ways this film parallels how I felt about Mission Impossible Rogue Nation, in that it’s a film that is spectacular but plateaus too early and then coasts to a finale that’s nowhere near as exciting as what has gone before. It also reminded me somewhat of Die Hard 3, a great film that’s somewhat lacking in the final stages—rumour has it the script for Spectre was worked and reworked quite substantially, and Mendes was, by all accounts, still editing with just a few days to do which may explain this. Bellucci is wonderful, and Seydoux makes for a decent and capable Bond girl as Madeline Swann, even if the character seems a trifle thin. The only real let down is that she and Craig lack chemistry, which would be fine only the film wants us to believe they’re madly in love and I just don’t quite buy it. The film looks gorgeous, the set pieces are, for the most part, spectacular, the film is more playful, and funnier than any other Craig era Bond film, and if I walked out disappointed this is mainly down to it ending up a solid 7 or 8 out of 10 rather than the 9, or even 10, out of 10 film it promised to be early on.